Atomic force microscope image of a protein nanospring reveals its coiled structure. A component of many proteins has been found to constitute one of the most powerful and resilient molecular "springs" in nature, researchers have discovered. The engineers and biologists from Duke University and the Howard Hughes Medical Institute say their discovery could lead to a new understanding of mechanical processes within the living cell. The discovery also could provide potent nanoscale "shock absorbers" or "gate-opening springs" in tiny nanomachines. The team's findings were published in an advanced online publication of Nature on Jan. 15, 2006. The finding that the protein components, called "ankyrin repeats," exhibit such unprecedented elastic properties could lead to a new understanding of how organisms, including humans, sense and respond to physical forces at the cellular level, the researchers said. The nanometer-sized springs are also ideal candidates for building biologically-inspired springy nanostructures and nanomaterials with an inherent ability to self-repair, they reported. A nanometer is one billionth of a meter. "Whereas other known proteins can act like floppy springs, ankyrin molecules behave more like steel," said Piotr Marszalek, professor of mechanical engineering and materials science at the Duke Pratt School of Engineering. "After repeated stretching, the molecules immediately refold themselves, retaining their shape and strength." "The fully extended molecules not only bounce back to their original shape in real time, but they also generate force in the process of this rapid refolding – something that had never been seen before," added HHMI investigator Vann Bennett, professor of cell biology at Duke University Medical Center. "It's the equivalent of un-boiling an egg." Marszalek and Bennett are participants in the Duke University Center for Biologically Inspired Materials and Material Systems. The research was supported by Duke University and the National Science Foundation. Ankyrin repeats consist of tandem modules of about 33 amino acids, the researchers said. Found in a large number of functionally diverse proteins in organisms ranging from plants to humans, ankyrin repeats are one of the most common protein-protein interaction motifs in nature. Ankyrin repeats of varying lengths appear in more than 400 human proteins expressed in many tissues, Bennett said. For example, ankyrin repeats are found in association with specialized hair cells of the inner ear, where they play a critical role in converting sound (a mechanical stimulus) into an electrical signal that can be transmitted to the brain – a process known as mechanotransduction. Ankyrin proteins also coordinate the ion channels and transporters that control the beating of the heart. In 2004, Bennett's team linked mutations in the gene ankyrin-B to an inherited cardiac arrhythmia syndrome that can lead to sudden death (www.dukemednews.org/news/article.php?id=9389). Earlier study of the atomic structure of 12 ankyrin repeats suggested that ankyrin proteins consisting of 24 or more repeats might form a super-helical spiral with spring-like properties, the researchers said. 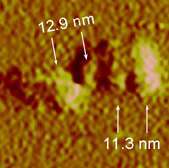 Using atomic force microscopy (AFM) to view individual molecules in the current study, Marszalek and Pratt research associate Yong Jiang found that ankyrin repeats indeed display a hook-like shape consistent with a spring. AFM is a technique for analyzing the surface of materials all the way down to the level of the atom. Marszalek and Pratt graduate student Gwangrog Lee further examined the molecules' elastic properties by attaching one end of the molecules to a glass slide and gently pulling at the other end with the AFM cantilever. "After thousands of stretches, a pattern emerged," Marszalek said. "The molecule exhibited linear elasticity--a property that had never been seen in any other protein." The ankyrin repeats act like linear springs, meaning that their tension is directly proportional to their extension, Marszalek explained. In contrast, the majority of elastic proteins that have been studied previously display a highly nonlinear behavior typical of polymers, he said. In the course of this discovery, the researchers also observed something unexpected: as long as they stopped stretching the molecules before they were completely unfolded, the extension was fully and immediately reversible. The ankyrin repeats showed no sign of wear after multiple stretch-relaxation cycles over a large range of applied forces, the team found. When extended past their breaking points, the molecules exhibited a saw-tooth pattern of regularly spaced force peaks as individual repeats unraveled one by one, they said. After this complete unfolding of the protein, the researchers observed that ankyrin repeats were able to rapidly refold and that process of refolding generated significant force, they reported. "This, to our knowledge, is the first report of the magnitude of the refolding force of a protein domain obtained through direct measurements on single molecules," the researchers said. The team speculates that the linear elasticity of 24 ankyrin repeats may play an important biological role in adjusting ankyrin-associated transporters in response to mechanical strain or in generating tension in cell membranes. The unusually strong tendency of ankyrin repeats to refold might also play a significant role in the function of proteins having fewer repeats. "Ankyrins appear to have a very unusual structural design – consisting of short anti-parallel alpha helices that self-assemble into stacks -- that allows them to quickly and robustly unfold and refold," Bennett said. "It's hard to believe, but it happens. You have to wonder whether their structure plays an important functional role in sensing forces." Alpha helices are common protein structures, characterized by a single, spiral chain of amino acids stabilized by hydrogen bonds. "We live in a world of forces," Bennett continued. "For example, every time a neuron pushes its way through body tissues to its target, every time a heart beats, or a bicep muscle contracts, forces are generated. Cells have to recognize those forces and adjust accordingly." The tension created by the ankyrin springs could allow for very rapid translation of mechanical forces into biochemical signals, he said. The proteins' spring-like properties could also be important for furthering the development of nanotechnology, Marszalek added. "These nanosprings could provide a wonderful material anytime you need to provide elasticity or force," Marszalek said. "They could open gates, for example, or could perhaps act as shock absorbers in nanomachines of the future." The researchers plan further work to understand what makes the structure of ankyrin repeats so special and to demonstrate the functional role of this structure to particular ankyrin proteins, such as those involved in hearing, the researchers said. The team will also investigate whether longer springs would maintain the same elastic properties, a finding with important implications for including such proteins in nanodevices.